Owners have moved their personal gear off the boat, being sold as-shown. Plenty of time to survey, enjoy and provision for your trip south. It is a rare occasion that a used boat comes on the market that scores as high as Mister Gus. No odors in the bilges or engine room, interior wood is unblemished and updated as required. Her new owners will enjoy cruising immediately without the survey punch list of essential requirements. One of the most practical, comfortable and easily navigated cruising platforms ever designed. Comfortable for a couple with room for guests. The Powerboat Guide: "Sovran 4400's Posh interior is a blend of satin finished teak, Corian counters and Ultra leather seating." The large saloon settee seats 5 and is served by a birds eye maple dropleaf table. Bow stateroom has island queen berth with en suite head and stall shower. Guest cabin has two single berths with en suite head and shower. It is reported that the first owner purchased and used the boat in the short seasons of the Great Lakes for 6 years or so. 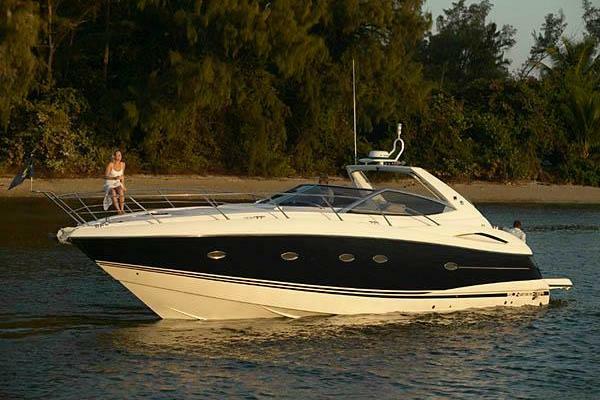 This explains the outstanding cosmetic condition of the boats machinery spaces and interior. Only 900 hours in 14 years. 65 hours per season just enough to keep her healthy.